You might want to clear a publication from the cache so that you can download an updated version of the publication from WOL - or to clear up some space on your device. 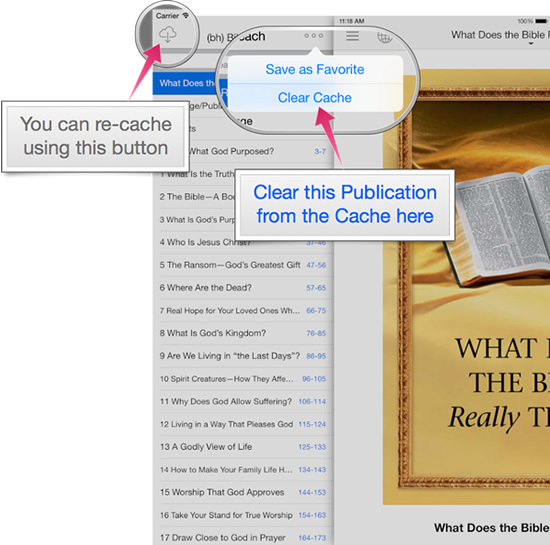 Use the action menu (...) and select "Clear Cache"
If you have annotated any of the chapters in a publication (i.e. underlined or highlighted anything) then the annotation file will still be present, and this will always take precedence over the original cached file. So you would need to delete your annotation file for a chapter in order to see the original cached file from WOL again. To do this, when viewing an annotated chapter at the top/right click the action button "..." and then "Delete Annotation File".